I recently went back to Soma and had a tour by the owners and got to experience some new chocolate experiences. It was a million times better than the last time I was there for sure. While I was there, I bought myself some chocolate including some Chuao bars and this Old School chocolate bar. It was recommended to me by the owners (frankly I would have bought anything they recommended) as a unique experience. Apparently this is chocolate as it was back in “the day” – simple and pure. But I think pure means not quite mixed all up until smooth and yummy. Well, it is yummy, just not smooth. This is, however, about as pure as you are going to get with chocolate as there are only two ingredients: partially ground cocoa nibs and cane sugar. This makes a bar that is almost like a cookie/biscuit. It has a constantly changing flavour depending on how you chew it and the bit you get. This chocolate bar is confusing but I love it. It is rough and chocolaty and yet has hard bits and nibs and chunks of cane sugar. It is bitter and sweet at the same time. This is a bar for chewing, not for letting it melt slowly in your mouth unless you don’t mind your mouth being flooded with sweetness. It isn’t conched for 96 or 120 hours – it is just as it is. YUM! 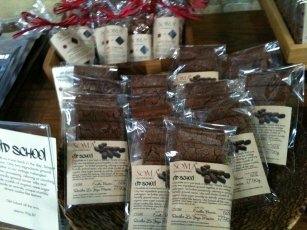 I certainly LOVE SOMA chocolate! But my preference is definitely the single origin truffles. They are truly divine.